Where would you want to live if you were going to settle down after your traveling or wandering expat life? Or where would you want to live now, if you were free to choose, and had no worries about having to support yourself? (Yeah, how cool would that be!) Hey, dreaming is cheap. Whenever I travel to another country, on vacation or otherwise, I always ask myself if this could be the place I’d want to live when my mate and I decide to find a more permanent perch. And of course, while on vacation in Turkey recently (we live in Moldova), I did some pondering and dreaming and considering while sipping wine at a beach-side cafe or wandering through the towns and markets. So, just in case you don’t get the chance to have a look for yourself at the southwest coast of Turkey, I’m offering up some images to seduce you, or not. NOTE: Turkey is rich in history and culture, which makes it a place with lots to see and do, and you can find all that in guidebooks and on the Internet. Here I’m just mentioning the little stuff you notice while walking around, eating out, and people watching. So don’t call me a shallow tourist. I know I am one. A cappuccino hookah? Well, why not. I love a sidewalk cafe culture. Hailing from Holland, I know all about sitting on terraces, drinking coffee and watching people. I love eating dinner outside in good weather. Café culture is definitely on my wishlist for my dream location. Turkey has it in spades, and you can smoke a hookah as well. The weather was cool, but the restaurants were ready everywhere. So what is on your wishlist for your dream location? Good weather? Great food? Turkey has a Mediterranean climate, so that’s perfect in my book. And Turkish food is Middle Eastern, varied, delicious. Even the street food is fun and tasty. What more do you want? Wine? No problem. Turkey is wine producing country, a fact I was not aware of. I read that grape juice has been fermented since Neolithic Hittite times. That’s quite a while. We found wine available everywhere in the stores and restaurants, and although it was not particularly cheap, we enjoyed many a glass. Beer? The local brew is Efes. Lamb was available everywhere, my favorite red meat. Below a view of the roofs. Sun energy heats the water in the tanks. Not pretty but it sure is energy efficient. We loved driving along the coast and in the countryside. Turkey is beautiful, even on a rainy day. I could go on but I know you don’t have all day. Just let me close with a picture of a shopping opportunity I came across. What is your dream location? What is on your wishlist? Beautiful photos and fabulous writing. If I had to chose for location only, I would pick Chile or Peru. I have spent the past 8 years in SE Asia and my childhood in the Middle East. I am ready for South America if I had a choice. Hi Karen that I’ve been to Turkey it’s fun I love that too. I don’t think I could move to somewhere permanently that was an Islamic because of all the needs for women to coverup and wear modest clothes. I’ve been hearing more and more about Turkey, and how many Brits are deciding to retire there. My son went there ten years ago, at 14, and loved the food and still talks about it today. He was sailing with some French relatives. The food looks delicious. I didn’t realize they use solar power. In a way, they’re ahead of the U.S. with their energy needs. 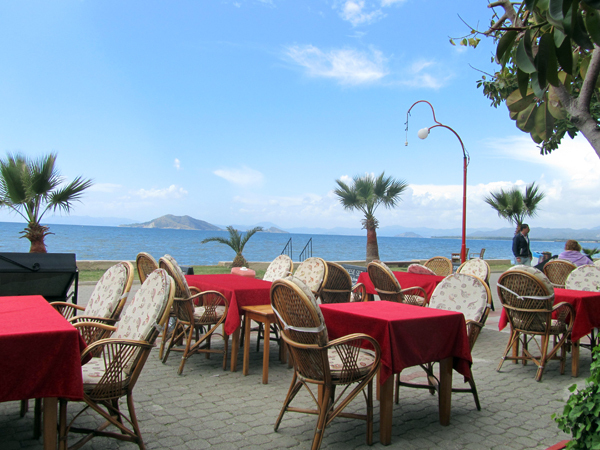 Lovely photos taken from your tripp here in Turkey! I’ve been calling Istanbul home for nearly 2 years now and have fully embraced my life here as much as I can. I may be an American expat and stand out as a blonde yabanci, but I make an effort to speak Turkish and shop locally at the markets. We’ve been able to travel and explore so much around Turkey – it’s full of history! Not sure where I’ll call home permanently again, but I’ll enjoy the adventure while I can. We haven’t been on holiday for years due to having a farmful of critters so I’m kind of out of the habit of seeing different locations and going through that fun thing of imagining yourself living there. From what I’ve heard, and seen here now, I’d love to live in Turkey. To think that back when I was growing up, Turkey was considered backward. But I guess it was really our thinking back then that was backward. You’ve got me thinking … We haven’t been on holiday for years due to having a farmful of critters so I’m kind of out of the habit of seeing different locations and going through that fun thing of imagining yourself living there. I’ll have to make do with being happy here for a while longer I guess! As long as there is plenty of snow in the winter (I love snow), and it isn’t too hot during the summer, I am quite happy. At least that’s my attitude right now! I’ve never been to Turkey as I was discouraged by their attitude to women. Love the genuine fake’s board. That is such a wonderful question and it’s one that I continually ask myself when I travel. Right now, I am an American living in Stockholm with my Australian husband. For a long time, we’ve said we would like homes in the southern and northern hemisphere so as to be in summer year round. And it sounds like I need to add Turkey to my travel list. They say that one hookah session is the equivalent of 100 cigarettes. I wish it weren’t so because whenever I go into a hookah bar it looks sooo relaxing and such a great way for people to enjoy each other’s conversation. Turkey is an amazing place though. I enjoyed your post! Oh dear! How to decide where to settle. Tough call for the Footloose of the world. I wouldn’t mind the 4 month plan…a season in Switzerland, Provence France and Northern Wisconsin, nestled in a little red cabin in the woods by a lake. Of course, I am sure part of the ties to that place are linked to family memories. At any rate, I hope I am healthy (and wealthy) enough to enjoy many more travels to distant lands. Thanks for sharing your wonderful photos. We have a day in Turkey while on a cruise in August. A day isn’t enough but we’d like to go back there for longer another time. I’ve wanted to live in England for ages, and hopefully that dream will come true in about 2 years’ time. Most of my friends think we’re crazy wanting to swap Australia for England, but I love it there. London is my first choice but there are heaps of other areas that I love too. Oh this is so fun to do! I think that my dream location for living is somewhere in Italy. We are relocating soon to one of my favorite spots to vacation (Singapore) … but I also have an inkling towards Turkey! We stopped off briefly from a cruise ship but one day was not enough!